Anna Chakvetadze was born on March 5, 1987, in Moscow, Russia. While Anna's mom is Russian her father is from Georgia. So far in her tennis career, Anna Chakvetadze has won 8 WTA singles titles. Anna Chakvetadze has earned or won just about $4 million in prize money. Women tennis players can earn very good livings these days. At the Grand Slam tennis events the farthest Anna Chakvetadze has gone in singles play is the semifinals at the U.S. Open. 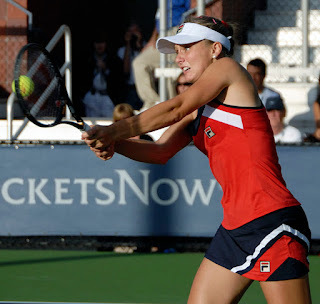 She also reached the quarterfinals at both the Australian Open and the French Open.